The CIS Healthy Nutrition Program is partially supported by LA City Department of Aging. CIS hosts the city-funded Open Nutrition Program which provides weekday lunch for seniors for a modest donation. The lunch meets Federal nutrition guidelines. CIS funds for a nutritious continental breakfast and an occasional PM snack, and supplements the hot lunch program for adults with developmental disabilities. The CIS Healthy Nutrition Program includes educational cooking classes regarding food preparation, healthy eating on a budget and knowledge of food resources in the community to ensure food security for underserved, low income populations. 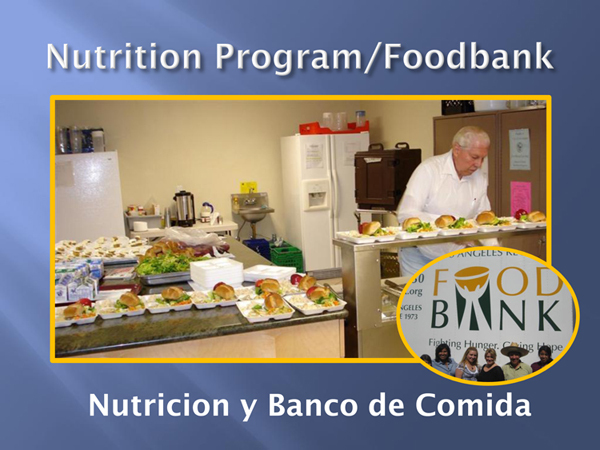 The Nutrition Program currently serves approximately 180 unique individuals a week at the program site. In 2011, CIS struck a partnership with the Los Angeles Regional Food Bank; CIS currently hosts a monthly food & staple distribution for low income/high need seniors who qualify. The food bank currently serves some 230 community members monthly.